(1) We can help make with Pocono hotel choices. (2) Poconos Honeymoon & romantic getaways as well. Poconos NE PA Attraction Discount Coupons: Pocono Mountains / NE PA - Scranton Region- Coupon Discounts Use these coupons for the best attraction discounts in the Pocono Mountain Region, the Poconos, NE PA, Scranton, Wilkes Barre, NEPA attractions, etc. Attractions include Camelbeach, Claws N Paws Wild Animal Park, Houdini Museum tour & Stage Magic Show, Kittatinny Rafting, Kittatinny Paintball, House Of Candles, Adventure Sports, Haunted, Mind Mysteries & THE Beyond, Big Brown Fish & Pay, Paradise Fishing Preserve, Lighthouse Marina, Boat Rentals, Scranton Ghost Walk, etc. 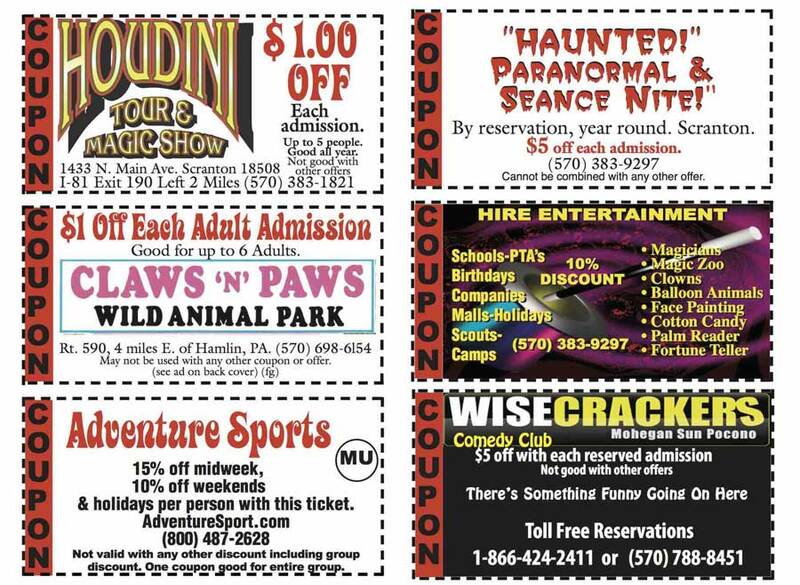 This page contains the discount coupons for the top ten or more premier attractons in the Pocono Scranton Wilkes Barre area. Included are The Houdini Museum Tour & Magic Show, Claws n Paws Wild Animal Park, Haunted Seance Show, Kittatinny Rafting, Boating, Canoes & Paintball, Camelbeach, House of Candles, Lighthouse Boat Rentals, Adventure Sports,Big Brown Fish & Pay Lakes and Paradise Fishing Preserve, Scranton ghost Walk, etc.